When we talked in September 2003, after the publication of your first novel, Under Fire (2002), you said you already had the outline of another novel, how soon should we expect to read the novel? 2003! That is already an age. You mean I have allowed so much time to pass without coming up with another work? Phew, in that time, two novels ought to have been breathing on the table. I had thought that what I had had been brought to a stage and so laid out that one should just do a smooth drive and that would be it. How wrong I was. Some pages of the outline, which is elaborate, have gone missing. Snatched away by the wind of time. I built a pattern, though simple, that requires a reorientation to keep it going. I have found myself in an undesirable situation whereby I have to walk through the worlds I meant to depict, or replay events in those contexts. I have to rediscover our people’s speech habits and choice of words to construct such scenes. Something like that. They are not inconclusive outlines, but whole portions gone missing. You cannot insert peanuts for perm kernels and expect a flow. The right attitudes have to be found in the appropriate places. Besides, my current research work came in and has to get priority attention. That naturally, caused some delays. Unless this current project gets out of the way, the manuscript will be lying where it is at the moment. The research work is boring. I detest conventions, and this is what I am forced to do. Rules here and there. Flowery language may be unwelcome here, which takes away the fun and the urge to move ahead with it. Assuming it were a novel, I wouldn’t need a driving license in every corner or adhering to a thousand traffic rules. In fact, I work on the novel once in a while as a kind of push for the project at hand. Else even the project will be there, with nothing going. One third of the novel has been written, which includes the last page. Let’s see; by the end of this year, 2008, we can be talking about a conclusion of a second novel. Publishing is something else, for obvious reasons. Thank you. How much of African and Nigerian Literature is being studied in Germany? German society is served by as much African Studies as the country requires. A German student who finds himself or herself in a classroom for African Studies understands his or her business there is a foundation for eventual social work in Africa. When one turns to a lecturer of African Studies, the reasons might be different. From the score sheet of African studies, the University of Bayreuth takes the lead here. The spirit for which it has been recognized manifests even now. Presently, it has a series of events that runs like a continuous programme in any university anywhere. In Mainz, there is the Ethnology Department, which houses the famous Jahn Library. The library is presently headed by a young lady, Dr. Anja Oud. It is awash with African books. The largest collection of African books in the whole world, I am told. This is mere aspiration than the fact, I guess. For all I know, a visitor will see as many books as possible. How they have been able to lift even the most unlikely books to the place is interesting. The response to the need for those books, while neglecting the use of the very books, is a great puzzle. There are insufficient courses, lecturers and purposes for so many books. So, the books lie there idle. The Ethnology Department is certainly home to the largest collection of African music worldwide. The man responsible for this is a Prof. Wolfgang Bender. He had had assistance from one Bayo. Ow-, the other name is elusive. Once, I benefited from a well-attended promo on Nollywood given by one Professor Frings. Yet, compared with the situation in the USA, UK or Canada, African Studies here is at the kindergarten stage. In the Ethnology Department, they are under-funded. Students are brought face to face with scholars from Africa through a commendable exchange programme. Why Africans only have to come and go remains a puzzle. Like Akachi Adimora-Ezeigbo was in Bayreuth some time in 2006. Elsewhere, African literature has really not qualified to ride in the same vehicle as say American literary studies or English literary studies. This is not far removed from the prestige that accompanies these literatures and cultures. In the English and Linguistics departments the closest students may come to anything African is the encounter with the name Nnamdi Azikiwe in Langston Hughes’ poems, or Onwuchekwa Jemie’s work on Langston Hughes, all in African American Studies. In which case, Jemie’s and Azikiwe’s roots are lost. In the library, Chinua Achebe’s and Wole Soyinka’s books may lie below an often visited book, the latter hardly noticed. Their literary status here is hardly diminished, for they are well represented in people’s leisure time, especially in the hands of people desirous of good literature. Ken Saro-Wiwa is the most prominent personality. What do you think accounts for Ken Saro-Wiwa’s prominence, the quality of his work, his struggles or manner of death? It has to do with the type of prominence bestowed upon oil politics. Worldwide, oil has a special place in news coverage. The quality of Saro-Wiwa‘s work has little to do with it. A girl with an African parent and I once honoured him (Saro-Wiwa) with a presentation. We were marketing what we thought was a good product. People were there yearning for their own Saro-Wiwa encounter and we had to satisfy that. In doing it, I was fully aware of what projecting him meant to my roots. If you took away the struggle and the manner of death, and without the signature of an African dictator, the fan base wouldn‘t have grown out of probably Africa or the UK. You know, Sani Abacha was unpopular in the West, because he was stingy. He forgot the rules of the game, wouldn‘t let the naira depreciate and so made enemies with the wrong people. You don‘t get away with such acts. In spite of the disguises, Saro-Wiwa and Moshood Abiola were rallying points for them. We will never fail to point out what is injustice, which was what Saro-Wiwa‘s was. If you can get that type of picture from Africa, of the innocence associated with literature on one hand and the brutish force on the other, you will have people coil around lit candles, and dance to the drumbeats of those media people. It was all a pre-arranged fight and one of the best plots in our time. Like, I guess, it was you who once pointed that out in a write-up; they must have whispered to Abacha that Saro-Wiwa wasn‘t untouchable. If a Saro-Wiwa were to be pushed into Robert Mugabe‘s hands and no love is shown to the writer, the story would be heard far and near. Okay, let’s return to the issue of readership of African literary works. I doubt if this matter of under-readership also applies to writers whose works are available in German. Achebe’s works, for instance, were translated into German many years ago. The need has to be there for the works to be translated. They haven‘t taken much notice of African works. Achebe‘s is like something that is there but out of sight. Things Fall Apart is like an African Beowulf. You wonder if somebody wrote it and disappeared. That is his dilemma. The West is the giver and taker of literary life, and one in charge of the African creative estate. On the other hand, the African writer is an orphan, an adopted child. He has to operate within some accepted standards, and listen to the voice of his guardian, who reports to a higher authority, the Western reader. On the idea of transforming our society into a large reading audience, one Segun Fajemisin, a publisher in Britain, once in a private discussion, suggested that flyers of novels should be slipped into home video CD sleeves, perhaps to invoke the home video magic. That is, making literature part of the menu. This means that Nollywood could pass the message around. There is the easy-to-listen audio arrangement that has gained currency in Europe. That way, consumption of the product may not interfere with every day things like driving. So also, with incentives, we can get crowds to listen to writers read from their works. We can begin from the home, by making entertainment literature visible in the house. By extension creating a fantasy world within the home that connects with the outside world. Parents will then routinely make their children tell them about the stories they read recently and vice versa. As a child I was myself partly led into the exciting worlds of mathematics and fiction by an elder brother. I found myself aged maybe six listening to the Medusa mythology from a sister of mine. The story was very complex, but the sensation the broken pieces therein left in my head perhaps was helpful. Besides, the powers of the images of Hercules and the two snakes held in his hands, and of orangutans from a book I won as a member of a youth volunteer society entitled Wonders of Nature really did sink in. Every household needs these siblings of mine. My parents were far removed from the scene. Sadly, it was short-lived. I also wouldn’t forget us children partly encircling a village lad and listening to akuko ifo or folk tales. Victoria Ezeokoli did try to re-enact this on TV. But you get these results if you have the African family intact. The family we have come to know today is one left to the care of the Nigerian reality. Now, we don’t know how to get our children back to schools. We need divine help to pull them out of internet cafes, from hawking on the streets, etc. The family has to be put back. Unfortunately, we let the extended family branch fall away, and every other thing is going with it. If we talk about something being fulfilling, Nigerian society rewards people who can boast of patronage, which is what a relationship with the West brings. The question is: what are publishers looking for in a book? Readers in turn would want to spend their money and time for brilliantly written stories. The scenery as painted in a novel may fail to excite a certain reader. In Nigeria, if you draw a line around most writers, you discover they are hardly on the side of justice. They haven’t made us see that they are sincere. A danger can go on as long as the edge of the murderous sword is directed elsewhere. Each time I hear an African writer demonstrate so eloquently this obsession with Western readers, I am always very uncomfortable; does it really mean that the success of the African writer, every African writer, must necessarily be dependent on his ability to successfully win the heart of the Western reader? You seem to believe so much that literary progress is largely dependent on the economic growth in a given society? Yes, and built on a stable platform. What of your own work, how has it been received in Germany? Also, do you think people in Nigeria have been able to discover it? Germany is not a fertile ground for African literature. African literature cannot free itself from the continent’s images of Rwanda, Dafur, etc. Only few African works have been perceived distinctly from these accumulated images that have refused to go away. In some quarters, I have been received much more than the novel. It is difficult to classify the book. There hasn’t been consistency, I have to admit. Personally, I don’t want to be robbed of my little freedom. I have refused to meet modest success at the deserved rendezvous. I have been able to extract myself from the scrutiny associated with success of any degree, to embrace the life on the street where I would be unnoticed. With my cooperation, the novel would have asserted itself much more effectively. Creatively, I can go anywhere with my fantasy. I can roam various spheres. I am aware of my skills. On the novel, there have been gratifying forwarded messages like “Tell Chinedu Ogoke, I can’t wait to read his next novel!” The novel isn’t a lightweight among works from my part of the world. Even when I had had to write essays in German and among people of various nationalities, the content of what I had put down had often drawn attention to me. The celebrity environment is a domain writers share with other artists. This thing is of great value. If I have been received, then yes, the book has been received. How far the book can go is not in question, but how far it has gone, is difficult to say. We don’t have figures from sales in Nigeria. That market has been left to the mobile phone marketers and so on. I haven’t reckoned with that market. If one out of every five students in Nigeria leaves the book out of his or her reading lists, then there is cause for concern. Here you have a book that celebrates them. But they haven’t discovered it. That is clear. I still believe that enough of the right things have not been done to exploit the potential large market in Nigeria. What really have Nigerian writers, publishers and educational institutions done to revive reading culture among the populace? I remember Chinua Achebe revealing the sales figures of his books in a lecture in the sixties and showing that he had more readers in Nigeria than all other places put together, so what has happened to change that? The gulf between the huge Nigerian population and the type of literature we‘re talking about is deeper than is apparent. With the forces against change fortifying their positions, hardly anything will be achieved. Lecturers and educational institutions should be prominent voices for change, which sadly they‘re not. They should seek the type of arrangement you have in Europe. As a ruler and as a nation, you need shoulders to stand on, as well as the people‘s consent to confront the world. You can‘t lead the people with a padlock on their lips, their hands tied behind them and with guns on their heads. You can‘t demand loyalty from me when there is litigation on your office and Nigeria‘s legitimacy. The Nigerian question needs our attention, and can‘t be wished away. In Nigeria, going to federal house is always in response to ethnic summons. We can see what the sprinkle of autonomy did somewhere, when after World War 11 Onitsha Market Literature (OML) with its gracefulness held sway. The circumstance spilled over to Chinua Achebe and the rest of them, hence that comment. Think of a currently thriving OML standing condemned in an Obasanjo‘s eyes. You can‘t build on sand dumped by sea waves. Literature has to be powered by democracy. Readers thirst for that recreation of life as stroked by the writer‘s pen. The book is something to fall in love with. It is romance that‘s involved and a directionless and insecure society chases away potential lovers. If we do what is necessary, that most cherished entertaining literature will find calm waters to drop its anchor and the people will get on board. Despite the trying situation in Nigeria today, youths can still be encouraged to read once the right things are done. Writers’ bodies could collaborate with the electronic media to awaken society’s interest in literary works through even jingles. You would remember that as youths, we were always given reading lists for the holiday period, but all that appear to have gone now. Youths used to compete among themselves who read more books; we have to find ways of reviving all that, if the literary enterprise would see tomorrow in our society. I think the writer should naturally be at the forefront, but that doesn’t seem to be happening. Yea, then there was the talk of who did what. We had to listen to someone‘s entire narration about a novel just read. It all conveyed a faith in books. One read texts inherited from relations, and distant cousins. The books contained information on the inside front covers and other places about their names, schools, like St. Catherine‘s Girls, Akabo Girls, Ndoki Grammar School, Abba Techs etc. Those people were valuable in the form of motivation. They left us with things to forge ahead with, therefore a tradition endured. We have to understand that the 50s to 60s Nigeria had some influence on that period when the books I mentioned were still available. But Nigeria has drifted too far away from that path. We don’t like the tune the West is playing but must dance to it. There is Western dictatorship in its fullness. In that 50s, 60s and into the 70s, the African merely found a new playground. He linked up with the African Diaspora to form a formidable team. He had his own share in literary criticism, where to patch and mend and what to ignore when it came to African literature. He went further to point fingers at what he felt about European literature and culture. On a good day, people hardly walked the streets of Paris without perceiving the presence of the African writer. Some writers showed assumed disrespect to the West with books like Pepper Clark’s America Their America. The West was cautious, unsure of our potentials. Now they have come knocking, everything sounds hollow. The African cultural base is now weak. The relationship is now specified. They have to endorse everything. We have scientists we can’t use, writers whose works benefit others. If you are singing before a world audience, of course, it is good to make effort to be understood, but in literature you shouldn’t carry it so far that we won’t find traces of your culture in your work. Let us say that they have been fair with their criticism, but partly because they criticize what they allow to make it to their table. It will take that African to appreciate African art and interpret it to the world. There is some hope, however. Recently I was a guest at literary an “Outreach Programme” organized in a secondary school by the Imo State Branch of the Association of Nigeria Authors (ANA), and I was excited at the measure of interest the kids displayed towards literary works. If such events are intensified, I think it would go a long way to reinvent the significant interest in readership of literary works. Or you don’t think so? The recruitment drive at that stage as you witnessed is remarkable. The benefit will be no doubt immense. But the goal shouldn‘t be raising readers from among them who would lack books to read, or people who would have stories to tell and would want to be heard, but wouldn‘t exercise any of that. Not when failure has been arranged in advance for them. Definitely, we will not spoil their fun if the institution of the right circumstances will come before or coincide with their maturity. I notice that our celebrated writers have found themselves being mobbed by these kids during literary workshops. It‘s welcome, but it will be awkward to conceive something without directing the energies into texts. We shouldn‘t be too preoccupied with those events without raising the literacy rate or political awareness in the country. University admissions, you will agree, are now prohibitive. We are deprived of reading moving stories like the type a friend told me recently about his childhood. If you spent a part of your teen years in a village between Abeokuta and Port Harcourt, it may also be your untold story. The friend and I agreed his story was not unique, but it ought to cease being just faint images in our consciousness. It is not found in any book. Now, imagine such thrilling experiences that happened on that stretch of land never being reported. Our oral traditions made certain that such gaps or ecological dilemmas never existed. To go back to my point again, literature is very sensitive. It only thrives in a democratic setting. Nigeria isn‘t a democracy. What can you say about the dominance of subsidy publishing, or what the Americans call, “Vanity Press” in the Nigerian literary scene – where writers either have to print their own works or sponsor its publication? It is disturbing. Yet, it‘s inevitable. What‘s behind it is resisting the hostile forces that intend to stem the flow of literature. Well, if there is no ladder available to climb to the top, people have to device ways of getting up there. Publishing houses can‘t assemble good teams to work with given the problems in Nigeria. Nigeria overflows with talents whose abilities publishers can tap into. Without editorial input, someone in that capacity bending over the manuscripts, like Irene Staunton, the publisher of the Baobab Press, did with some Zimbabwean writers, literature in Nigeria will only manage to stand over its mediocre neighbours,’ and short of expectations. It’s the case with a movie, which needs a director’s competence to modify certain elements for desirable results. Also, it has to be linked to a good distribution network. ANA is simply handicapped by its short-sightedness. Like I said earlier, language may be a strong barrier in those Western nations where English is not the official language, like Germany. Because works of Nigerian writers are better known in the UK, for instance. Apart from Achebe and a few others, how many other Nigerian writers have had their works translated into German, for instance? You don’t feel some interpreters and language scholars, especially, of African descent, have not done enough in this regard? Language is without doubt a factor. But the problem is more of attitude. Use of English has developed so much that the population with this knowledge at its disposal can consume the trickle that comes in. The people have a strong appetite for books. Unless you have a book that does to everyone what Things Fall Apart does to people, pushing an African book into someone’s hand is like handing him a bitter pill. The contents of African works are in conflict with the local taste. Readers are reluctant to explore Africa with Africans as tour guides. I am not making the connection of appreciating African literature because of it being unusual. The source of the material plays a role. They dedicate their time and resources exclusively to much advertised concepts. The same thing goes for cuisine. Chinese restaurants are popular. In effect, Chinese products, including its literature, benefit from this development. The new interest area now is the Middle East. Latest events in the world make the people curious. You don’t also rule out old traditions. Assuming Africa begins to command some respect around the world, its literature will be popular here. The Harry Potter series are especially popular because the writer is a British woman. When David Beckham dons your jersey, you obviously will smile to the bank. An Austin Okocha may not get such following in spite of all the wonders credited to him on the pitch. We should find a way of redesigning the African image, clearing away the backlog of slavery, colonialism and neo-colonialism. Previous attempts to correct these have, sadly, been futile. 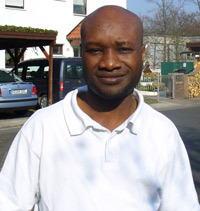 Many works by writers from Nigeria can be read in German. Saro Wiwa, Soyinka, Achebe, Chimamanda Adichie, Nkem Nwankwo, etc. And even a new guy, Francis Obimma, who just rolled up his sleeves here and started writing, debuted only in 2006 is about to join that club. Somebody looked at the young man’s work and decided the state should put its translation services at his disposal. African scholars can play a role by preparing the home turf, and letting the world know about the good news from Africa. Promise Ogochukwu is doing her part by establishing the Soyinka Prize. A writer putting up a structure and allowing another writer to walk away with $20,000! When we hold up the hands of one of our own so high, Europeans will take note. When what applies to some of our frontline books also apply to a book like Obinkaram Echewa’s I Saw The Sky Catch Fire, then we can talk about clear perceptions by African writers and critics. Standards must be maintained but African critics must employ new tactics in their criticisms. African scholars must endeavour to free Africans, Europeans, Asians and everybody from neo-colonialism. A lot cannot be reversed, but we must decolonize everybody’s mind. The result will be Africans bankrolling events like the late Zimbabwean Book Fair; organs like the Association of Nigerian Authors (ANA) and the African Book Collective will have to be strengthened. Your work was not published in Nigeria. Is there any form of collaboration with a Nigerian publisher to have the book adequately exposed to Nigerian readers? It hasn’t been published in Nigeria. I wish the second one would first make its appearance in Nigeria, before making the trip outside. There is no collaboration to do that. I would have received a call from my publishers if there has been any interest emanating from Nigeria. Though insignificant, there has been an uninterrupted flow of copies to Nigeria. This shows that the people over there are not unaware of the book. The publishers also have this information. They have to bring the book home. When last did you re-read your novel? Did you have any cause to feel it could do with some form of revision, or even editorial input? Last time was late last year. I take it off the shelf occasionally to read it in a critical way. No considerable length at a time. Definitely, aspects responsible for some scary remarks about the novel have to be revised. It‘s sad if the book has to suffer more for those lapses than it is considered worthy of acclaim. There have been criticisms I consider unhelpful. One critic, Professor Shuiabu Oba AbdulRaheem, a former vice chancellor of University of Ilorin, passed a judgment on the novel with which I agree. He developed an argument using especially my novel in a paper he delivered at an annual Lecture of the Nigerian Academy of Letters (NAL) in 2005. His assessment of the novel included very severe criticisms. The judgment I find interesting was his observation that “Although Chinedu Ogoke does write vividly, the same kind of critical fate which excluded the likes of Cyprian Ekwensi’s Jagua Nana from the ranks of the great Nigerian novels will, regrettably, overtake this exciting, juvenile novel.“ I know it is necessary that the book emerges from that rear position, where it wasn‘t intended to be in the first place. Identifying its weaknesses personally isn‘t easy, though. But I am aware I still have some work to do to make it catch up with those other works. Other things have my attention now, like the one about to join the small family, which is the second novel. Ugochukwu Ejinkeonye is on the Editorial Board of the Independent, a national newspaper published in Lagos, Nigeria. He writes a highly regarded column, (SCRUPLES) on the back page of the paper every Wednesday. eMail. Blog.